Meteoservis is different weather app. It is the complete weather service with professional background designed specifically for Czech and Slovak Republic, build by a team of developers with experiences with meteorology. Unlike most similar applications, Meteoservis doesn’t draw forecast data from other servers or meteo-sites, but he directly interprets the outputs of numerical models. It’s based on the detailed weather forecast in three-hours intervals, so you always have a complete overview of how the weather will change in the course of the day or night. Meteoservis will fully appreciate amateur weather forecasters and other enthusiasts and fans of weather monitoring. But even ordinary user will find here verbal forecast and an 5-days overview of the weather. Meteoservis is available in several editions, which differ in their capabilities and amount of data displayed. Before purchasing, you can download Trial version. Meteoservis is currently targeted to Czech and Slovak territory but we plan to extend the service to whole Europe soon. This edition is intended for advanced users who will find here comprehensive weather information and detailed forecast. • Professional background. Build and maintained by professional developers with meteorology knowledge. • Meteoservis analyzes and interprets numerical model outputs directly. 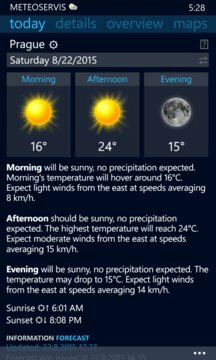 • Detailed weather forecast incl. perceived temperature (Windchill). • Doppler radar data for Czech Republic and Slovakia and satellite images of Europe. • Advanced information like synoptic situation in Europe, current temperatures or lightning activity. 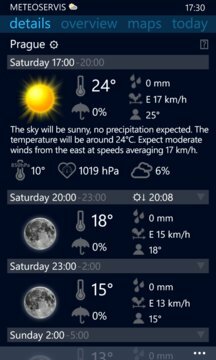 • LiveTile shows the weather forecast. Optionally, radar images can be displayed on the back side. • Supports wide-tile and LockScreen with many options. • Several iconsets, full color theme customization and plenty of other options. • Continuous development of the application, official site and discussion forum.